You wouldn’t expect Holly Herro to be a fighter. She’s graceful, slender, and soft spoken. Yet Herro is as tough as any heavyweight champion. When it comes to the threats of time, light, humidity, and potential pests damaging important historical documents, she’s one of the fiercest competitors in town. She does whatever it takes—whether it’s cutting with a guillotine or using her own saliva—to conserve historical documents at the National Library of Medicine. Herro is the senior conservator at the National Library of Medicine, home to the world’s most extensive collection of medical information. Looking back, a career in conservation at NLM seems like a perfect fit for Herro, but her route to get here was circuitous. Herro tells NLM in Focus about her journey, tools and tricks of the trade, and the documents she’s fighting to conserve now. Herro wanted to major in art, but her father had another idea. He insisted his daughter get a degree in business, which she did. By the age of 25, Herro was managing a marketing team of 10 people. After her career in marketing, she found a position working at a “nice, cozy library” in Richmond, Virginia. So happy in fact that when the Virginia Historical Society in Richmond approached her about a library position that would lead to a conservation job in the yet-to-be-built conservation lab, she had to think about it, even though it would allow her to use her art skills. Using magnification, Herro demonstrates the technique she uses to locate and document unstable media. 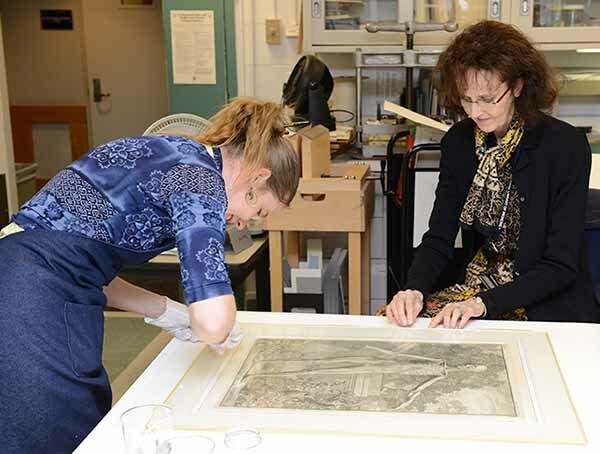 She advanced from conservation technician to an associate book and paper conservator, and for seven years she conserved books and papers for the Society. But library work was still important to her, so she commuted to Catholic University in Washington, DC, to complete a master of science in library and information science. She also began training in rare book conservation and advanced paper conservation with senior conservators from the Library of Congress. Then a dean from the University of South Carolina came calling. The university needed a leader to start a preservation and conservation program for its seven libraries. Herro wasn’t particularly interested, but she halfheartedly updated her resume, not even taking any effort to print it on nice paper. When university officials flew in to talk with her, they offered her a job that day. Finally, she accepted the position and loved it. During a decade there she developed a reputation for giving her graduate students hands-on experience. She also expanded the conservation lab’s reach by providing preservation and conservation reference services, training, and educational materials for libraries through the state. But the last few years became difficult as she traveled back and forth to Virginia to care for ailing family members. Something had to change. For the first time in decades, Herro was actually looking for a job. Fortunately, NLM posted a position for a conservation librarian. Again, Herro had to think about it. After about the third phone call from the section head of Rare Books and Early Manuscripts, Herro said yes. When Herro accepted the position at NLM nine years ago, she was following the wisdom she frequently gave to her students. There was one night when she was so caught up in her work, that she didn’t even realize it was 3:00 a.m. In some ways, Herro’s lab in the conservation department is like all the labs on the NIH campus. She follows strict standards for storing and using chemicals, adheres to safety rules, and is subject to inspections throughout the year. But the equipment in her lab and office set her apart. “We have a concoction of things needed for a variety of purposes,” explains Herro. The equipment ranges from an antique paper press, an oversized paper cutter, and a guillotine for cutting stacks of paper and board to modern equipment that has been repurposed. For example, an incubator hood for premature babies was equipped so she could create a humid environment under the hood, which is helpful for relaxing rolled documents. Just as repairing manuscripts and books requires specialized equipment, it may require special ingredients. Bathophenanthroline test paper (iron gall ink tests strips), threads for repairing the bindings, leather for binding books, gold leaf, toluene, acetone, or even spittle (saliva) are just a few of the tools. Spittle helps to surface clean rare collection items. In other words, the determined Herro does whatever it takes. But whatever is replaced—whether it’s a corner of a page or the original spine of a book—is kept with the book. The code of ethics for the American Institute for Conservation covers documenting everything visually and narratively. Herro and her team of three conservation staff take the code one step further by keeping a database. 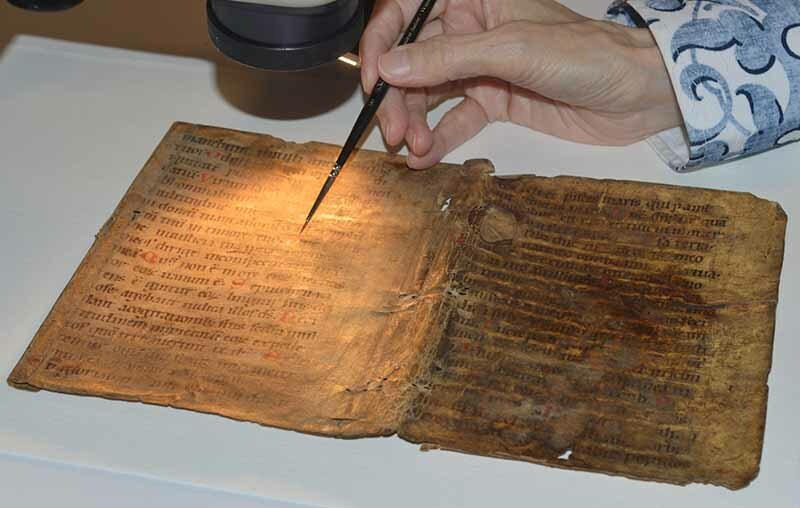 Decades from now, conservators and researchers will be able to search for what was done and why. Red rot is a degradation process in vegetable-tanned leather. For several decades, people tried to contain the red rot by oiling the spines and covers of books. The oil was wicking through leather-covered cases into the pages of text block. Herro queried colleagues for advice on how to lift the oil from the pages of historic books. She tried their suggestions. Nothing happened. Then she heard there was going to be a lecture on removing oil from ceramics. Perhaps she would learn something useful? “It was in town, there was no charge, so I figured why not go?” she says. She ended up sitting next to a friend of hers who restores oil paintings. That was her aha moment. The lecture wasn’t helpful but her friend was. Herro brought in her friend and a multi-disciplinary team of conservators who collaboratively developed a technique that involves using solvents aided by suction on the paper to remove the oil. “We not only solved the problem, we showed we could work together to solve each other’s problems,” says Herro. She and an NLM colleague wrote about their collaboration in Circulating Now. That same day, the American Institute for Conservation (AIC) picked up the blog post and tweeted it to its 10,500 followers worldwide. She also delivered a presentation about the process at the AIC meeting in Chicago last week. Ask Herro about a book she’s worked on by title or call number, and she probably won’t be able to help. If you describe the look and feel of a book she has worked on, however, she remembers. Like many conservators, Herro rarely reads the documents she’s working on. “If I read everything I work on, I wouldn’t get the job done,” she explains. This doesn’t matter if it’s a diary of George Washington for the Virginia Historical Society or ancient medical texts at the National Library of Medicine. But the magnitude of what she does is not lost on Herro. The first time Herro attended the National Library of Medicine’s Board of Regents meeting to show Marshall Nirenberg’s genetic code charts, she understood. Unlike the real Rosetta Stone, the Nobel Prize winner’s charts are in trouble. 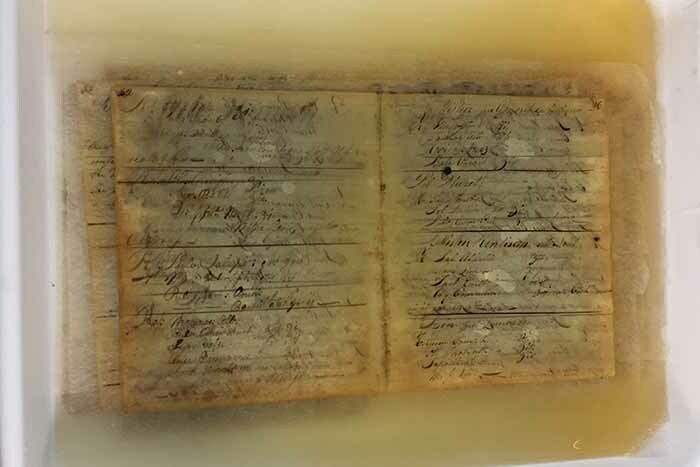 When it comes to historic documents to conserve, newer is not necessarily better. Marshall Nirenberg’s charts are in danger of deteriorating because of the acidic graph paper substrate; the pressure-sensitive tape used to attach the pages; and the instability of the ballpoint pen inks. “We have to do this right,” said Herro. Ballpoint ink, tape, and graph paper might have been helpful tools to create the charts back in the 1960s, but time is taking its toll. Herro has assembled an all-star team to protect, preserve, and conserve the charts. She’s called in a conservation scientist who specializes in ballpoint ink, adhesives and paper. She’s working with other HMD staff and members of the fabrication team at NIH to create an anoxic or no-oxygen housing for the charts. And Norma Heaton, a chemist from Dr. Nirenberg’s lab, has put the charts in chronological order. Herro is doing everything possible to conserve the charts for future generations. She lives up to her last name.